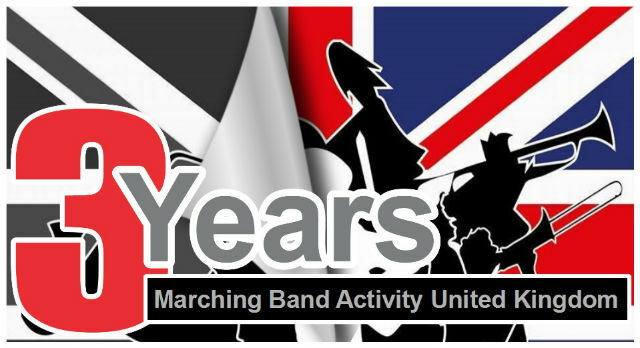 Marching Band Activity United Kingdom (MBAUK) is a refreshing new online area for anyone that loves music and marching to share positive stories and to share information about themselves, their past, or indeed about things they are aware of coming up in the world of music and marching throughout the United Kingdom that they feel would be of interest to other like-minded individuals or groups. A completely neural area where the only focus is on spreading the very positive news that is out there and boy is there some great news to share. Founded by John Butler in May 2013, MBAUK now has a combined Facebook / Twitter following of approaching 10,000 which is very significant here in the UK. In 2014, MBAUK partnered with Thurrock Marching Brass to attempt a new World Record for the Longest Fanfare Line using valved instrumentation. An attempt that saw success in setting a new World Record on Sunday 6 September 2014. Also in 2014 the charity Autism Plus contacted Marching Band Activity United Kingdom in regards to their social enterprise Mayfield belllyres, since then many connections have been made through the charity including the launch of an Instrument Campaign, helping to connect music to autism users with many instruments already being donated. Always looking for new and exciting ways in which to promote all that is good about music and marching a new web site has been created to start to share connections and contacts from across the United Kingdom and to create a central pool of information that is really useful for everyone to tap into. Band lists and locations, trusted suppliers, local and national events across the UK all form part of this ventral pool of available information. As part of the promotion of good work that everybody does, MBAUK runs, amongst many other campaigns, marching band awareness and weekly recruitment campaigns for all groups, and uses its increasing reach to share that information with the wider audience. This doesn’t just stop at the Facebook, Twitter or Web Site areas as we have also started to open up channels through local and national radio stations too. Always looking to promote and to share, MBAUK welcomes all positive interactions and interest so that we can keep the benefit of free flowing information continually running, and that could include you too so feel free to get in touch with us at info [at] mbauk [dot] co [dot] uk and we will be happy to look at working with you to share your news or information. Posted by News Editor on Saturday, April 9th, 2016. Filed under British Youth Band Association, Drum Corps U.K., FrontPage Feature.